School has started back and so have our fall sporting activities and there are a few nights that dinner is CRAZY in our house. We are all eating at 47 different times! It is so much easier to just grab something quick at one of the 5 fast food places but I am trying to encourage us to eat out less and at home more and if you know me you know I LOVE!!!! to eat out and I am not a huge fan of cooking at home! 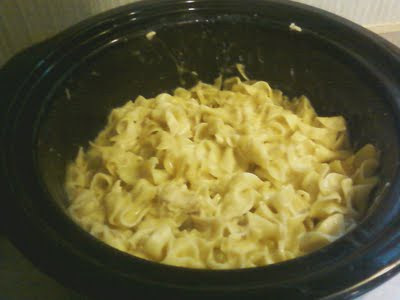 All that to say I gave the ole crock pot (and the liners) a try and let me tell you it might be my new best friend!!!! I started dinner that morning and came home and my house smelled divine and dinner was so yummy too! So I thought I would share this yummy recipe!!! I ask my kids if this was a "keeper" and the both said YES!!!!! Maybe your family will enjoy it too! Combine 3-4 boneless, skinless chicken breasts, 2-10.75 cans of cream of chicken soup, 1/2 cup of butter (sliced) and 42 oz. of chicken broth in your crock pot. Cover & cook on low for 8 hours. Add bag of egg noodles. cook for 1 more hour. Enjoy!!! It was a crowd pleaser at our house!! !